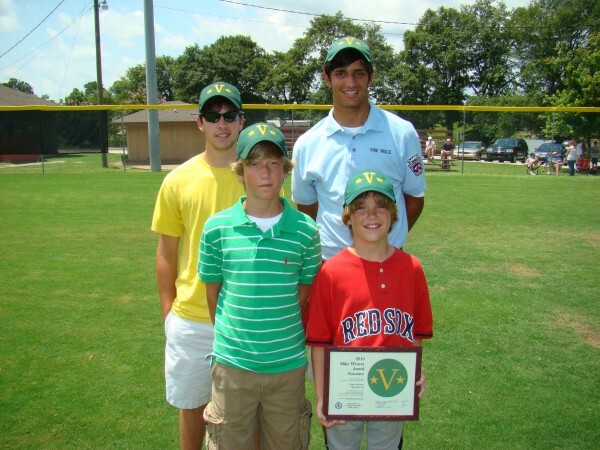 Custis Donner was named on Saturday, June 5 as the winner of the 2010 Mike Weaver Award at Vine Ingle Little League. He is the son of Beau and Kimbrough Donner of Macon. Custis was selected from among 10 finalists, one from each team in the league. 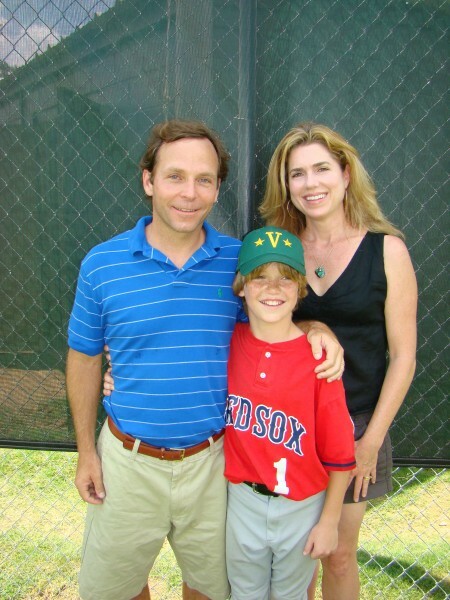 He was the representative from the Red Sox. The other finalists were Jacob Oates from the A’s, Parker Faircloth from the Astros, Alex Koplin from the Dodgers, Clayton Montgomery from the Giants, Tommy McCook from the Orioles, Jacob Brewer from the Pirates, Nicholas DiPonzio from the Reds, Blake Simmons from the Royals and Charles Stroud from the Yankees. As the winner of the award, Custis receives several prizes, including a trip to Atlanta to see an Atlanta Braves game and to attend Six Flags over Georgia. Present for this year’s ceremony were Bill and Erin Weaver and their son Dan. Their daughter Molly and her husband Brad could not attend this year because Molly is due any day to deliver their first baby. Bill Adams from Vine Ingle does much of the organizational work to select the winner, and his son Stephen — who was a good friend of Mike’s — is involved in the organization of Weaver’s Weekend, a fund-raising activity for the award. 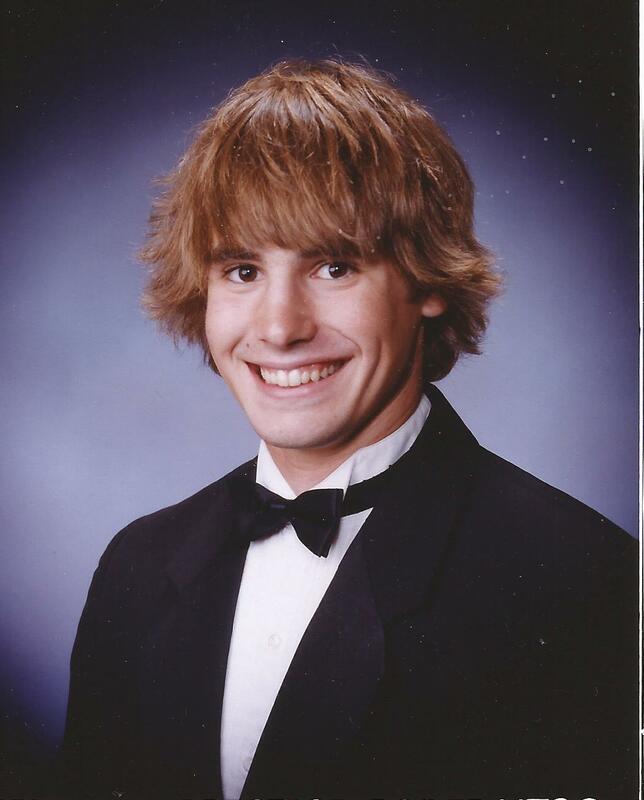 Many of Mike’s friends often attend the award ceremony, but they were absent this year due to a friend’s wedding in South Carolina. The weather was hot and muggy on the Vine Ingle Major League field. 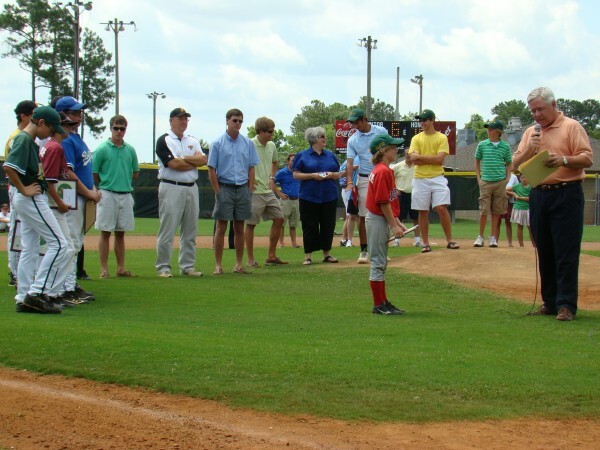 The Mike Weaver Award ceremony is held after the first game of the league’s season-ending tournament, and immediately following the presentation of the George Jones Award. Finalists for the Mike Weaver Award were, from left to right, Nicholas DiPonzio from the Reds, Tommy McCook from the Orioles, Blake Simmons from the Royals, Jacob Oats from the A’s, Jacob Brewer from the Pirates, Charles Stroud from the Yankees, Clayton Montgomery from the Giants, Custis Donner from the Red Sox, Parker Faircloth from the Astros and Alex Koplin from the Dodgers. Three previous winners of the award came back for the 2010 ceremony and joined Custis for this photo. 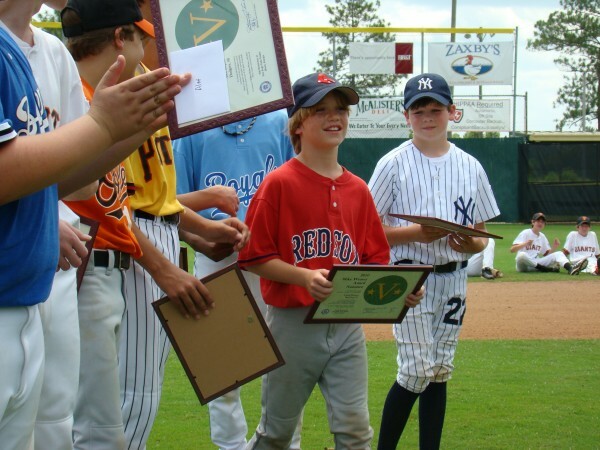 There were, from left, Brannon Hicks (2006), Chandler Lord (2009) and Matthew Maier (2005). Great pictures! Great Boy! Great family~ We love you! Way to go Custis! We’re very proud of you and hapy that you were selected for this wonderful honor!